Our logo designer Jaimie Weeks-Seufert is featured third from the right in the front row. Thank you, Jaimie! 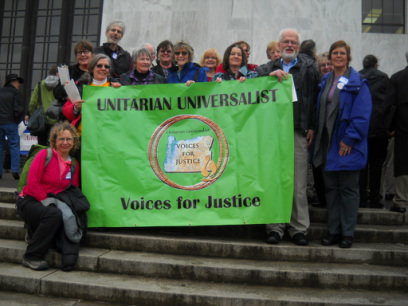 and don't forget to join Oregon UU Voices for Justice. Click here. Not sure who your elected officials are? Need information on a particular bill? Click the image﻿ to find them. Oregon UU Voices for Justice has four campaign areas -- Deepening Democracy, Human Rights, Economic Inequality, and Environmental Justice. At our annual conference in October 2017, we identified specific action items within each of these campaigns and people who are taking the lead on each. ​Some of these campaigns will stay in touch throughout the year and organize via Zoom to continue the work started during the Annual Conference. If you have an interest in these campaigns please contact the lead. Reforms to the Political Process: The group will meet again to focus the group on a specific issue. Under consideration: allow limits on campaign contributions, amend the US Constitution to end corporate personhood and money equals speech, limits on campaign contributions/expenditures, public funding of candidates, ranked choice voting, gerrymandering, full voting rights for felons, full disclosure of political ad funders. ​Support for Public Banking: The Portland Public Banking Alliance is active on this issue and meets at the First Unitarian Church in Portland, focused principally on creating a public bank in Portland. That effort has the support of David Delk, Michael Wade and Harriet Cooke, all members of the Economic Justice Action Group of 1st Unitarian of Portland. Borrower protections, HB2588 - require loan servicers collecting on private and federal loans to be licensed by the state. Creates office of Oregon Student Loan Ombudsman. Read informative article in Salem Reporter on this issue here. 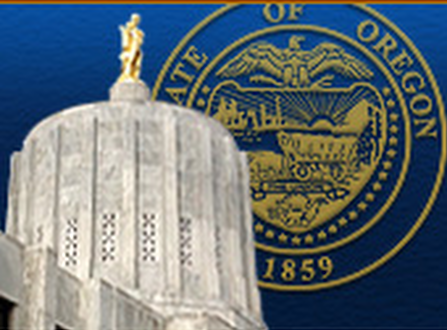 Clean Energy Jobs Bill, HB2020 - This carbon cap and invest bill is designed to reduce carbon emissions in Oregon. Jordon Cove LNG Export Terminal - Track and support any action identified to oppose the project. Work with tribal leaders. Leads: Jean Townes and Sue Craig (sueacraig@gmail.com). Single use checkout bags - HB2509/HB2653 - Prohibits use of single use checkout bags except in certain cases. ​Attendance fee: $30 adults; $20 teens; scholarships available. Homestays are available. Please indicate desire for such when registering. We will be in contact. Youth have stepped forward in record numbers with amazing influence this year. What can UUs learn from these “in the news” social justice campaigns? With synergy, we can each take action, multiplying impact and influence!